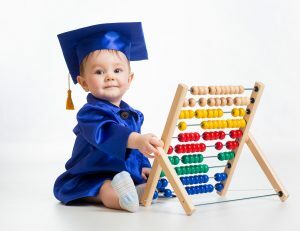 Math is such an important subject to work on and explore with your little one. Even at a young age you can begin sneaking in math lessons with your little one. The key is to make this time fun and not such a chore. Your child won’t even know they are actually learning! 1. Count everything! Even when your child is a few months old you can begin counting with them. Even when you are changing your child’s diaper you can have a learning experience by counting out loud. Count out loud to your child by counting their toes and little fingers. As they begin to get older find their favorite items and toys and count them out loud with your child. Make it a fun game! Any opportunity to have them repeating numbers is a beneficial. 2. Identify colors whenever possible. At home it is very easy to work on colors, while simply getting dressed you could talk about each clothing items color. Simply ask your child, “What color is your shirt, pants, shoes”. Just asking simple questions of colors around the house is an easy way to get that time in. I like to play color games at the grocery store. We like to play I Spy color game while shopping. My children really enjoy playing and it keeps them busy and distracted while learning and having fun. 3. Sorting is another easy math topic to do at home. Sorting items and toys by shape and color is a great way to build this skill. If you have two hula-hoops lying around you can utilize them in a sorting activity. Put the hula-hoops down on the floor and use them as a tool to sort objects. One circle could have red items only in it and the other have blue. Have your kids sort and even race while doing the challenge to make it harder. 4. Making patterns is another easy topic to work on with your child at home. Again, finding objects in your home is an easy way to practice making patterns. Have your child make simple color patterns while playing with Legos, art supplies, or even their food at dinnertime! Having your child make patterns while eating dinner – have them line up their peas and carrots in a pattern on their plate while eating! Silliness and fun to get them learning! I would like to also suggest taking these activities outdoors. Outside is a wonderful place to do all of these math activities as well. So many objects in nature are awesome to use for hands on items to practice counting, colors, sorting, and making patterns. The most important thing to remember while being intentional practicing math skills at home is to be sure that it is fun! Remember the key is that your child and you are having fun exploring while learning.